After the foam curlers I decided to try the "headband trick" for a great overnight, no heat hairstyle. Unfortunately, this one did not fair very well for me :-(. Basically the whole front portion of my hair came out of the headband so in the morning I just had some lame waves in the longest parts of my hair that fell out very quickly. This headband really doesn't stay on my head over night, this is the second time I've tried this trick and both times the headband has come off in the night. This is surprising because your hair is wrapped around the headband so you would think it would hold it in place. I have seen this work really well for some people, it just doesn't seem to be the best option for me. I may try putting the headband underneath my hair, as you would a regular headband, and then wrap the hair---this may keep the headband in all night. Take a stretchy, comfortable headband. Put the headband around your head over your hair (hippy style). 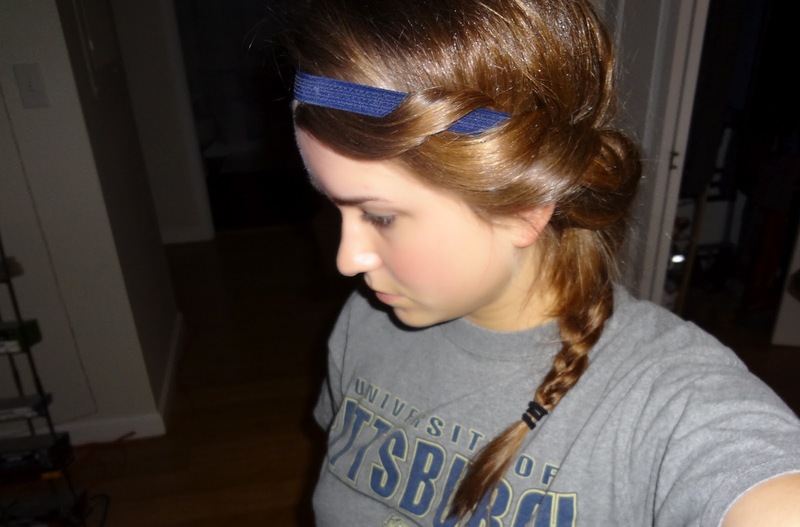 Take the hair underneath the headband and wrap it around the band, gradually moving from front to back. When you reach the back, if your hair is long like mine, there will be quite a bit of excess that doesn't quite fit into the headband. In the picture below it shows that I braided this remaining hair, after I took the picture I changed my mind and wrapped it into a tiny bun. Try applying a conditioning treatment/shine spray/hair oil or something along those lines before doing this trick. This will give your hair great shine and reduce frizz in the morning. Also make sure your hair is somewhere between damp and completely dry...if your hair is too wet it won't dry overnight. Another tip: apply a root lifter and then blow dry your hair for a bit, this will give you more volume the next day. Reduce eye puffiness with this product! 5 minute hair: Quick and Sleek!